Photo by Charles McCain, via Flickr. With their courageous acts of civil disobedience at the Air Force and Air National Guard bases that control the drone strikes, Code Pink and other activist groups are sounding the clarion call that these remote-controlled killers commit war crimes. But amidst the growing recognition of the brutal effects of armed drones abroad, it’s also time for activists to take a hard look at the brave new world of surveillance drones being used here in the United States. In February, Congress quietly passed a bill that enables the Federal Aviation Administration (FAA) to fast-track the “efficient integration” of Unmanned Aerial Vehicles (UAVs) into the national airspace, with nary a cost-benefit analysis or impact study. This came after the December crash of a U.S. drone on the Iranian border, which highlighted both the high crash rates of drones and the windfall of intelligence that the vulnerabilities of U.S. stealth technology could reveal to its stated enemies. The bill also lacks mention of privacy risk assessment or protection, to the alarm of civil liberties advocates. Since its passage, a number of citizen groups — the ACLU, Electronic Freedom Foundation, the Electronic Privacy Information Center, a congressional caucus led by Ed Markey (D-Mass) & Joe Barton (R-TX) — have been calling on Congress to address the “invasive and pervasive surveillance” that it makes inevitable, but to no avail. In the profligate world of defense contracts, drone research and development are going strong, bringing us ever closer to the Clinton-era Department of Defense’s “Joint Vision 2020,” which imagined the U.S. at the helm of a ring of satellites girding the earth, combining all-seeing vision with deadly force. In March, two drones performed the first-ever successful test of autonomous in-flight refueling at 45,000 feet, and it was revealed that Sandia National Labs & Northrup have favorably assessed the feasibility of a nuclear-powered drone. Two months later, NATO capped off its summit by signing a $1.7 billion deal with Northrup Grumman for its Global Hawk UAVs to be integrated into NATO’s “Allied Ground Surveillance” system. On June 1, a liquid hydrogen-fueled Boeing spy drone called “Phantom Eye,” designed to stay aloft for four or more days at a time, completed a successful flight. It’s not news that the U.S. spends vast sums on shiny new toys for the military while its municipal budgets are strapped. What’s startling is that both trends may well yield more drones. While critics of runaway military spending, waste and fraud can credibly point to the unwieldy cost of military drones — in March, the Air Force assessed the cost of an unexplained August 2011 drone crash in Afghanistan to be $72.8 million — the future of domestic surveillance drones, in contrast, appears shockingly inexpensive. “The drones cost $3.36 an hour to operate, which compares to $250 to $600 an hour for a manned aircraft,” a county policeman from Denver told Bloomberg. “Governments that in the past couldn’t afford helicopters can now afford UAVs,” explained the spokesman for a defense-industry consulting firm. Now, for about the cost of a squad car, a local police department can get a drone. Should city and county governments nationwide wish to look to drone surveillance as the answer to their budget problem and not know where to turn, the federal government is ready to help. In May, The Department of Homeland Security launched its Air-Based Technologies Program, which will “facilitate and accelerate the adoption” of small, unmanned drones by police and other public safety agencies, positioning DHS as the central point of coordination for private aviation technology manufacturers and police and sheriffs departments nationwide. 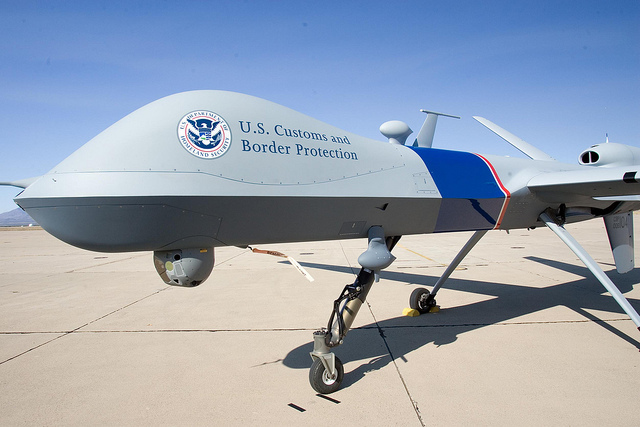 DHS already runs the nation’s largest fleet of domestic surveillance drones: the Customs and Border Protection Agency has used them to monitor U.S. borders for illegal immigration and drugs since 2005, at a cost of more than $250 million to date, with unimpressive results toward its stated intent. Nonetheless, Homeland Security’s drone program will continue to be well-endowed, and by 2016 it will have the ability to deploy a drone anywhere in domestic airspace within three hours’ time. The image conjured of a militarized, federally-coordinated surveillance state is augured by the preparations now underway for the 2012 London Olympics. London’s security system will include surface-to-air missile systems, supplemented by drones and coordinated with checkpoints, ground-level scanners, biometric ID cards, and license plate and facial-recognition CCTV systems. In Athens, site of the 2004 Olympics, the police evidently intended to keep the surveillance and security systems in place when the games were finished, and it would seem that only the rampant corruption, poor management and faulty implementation that plagued the system in the first place prevented police from using it to quash protests earlier this year. Given that the deployment of these surveillance drones is in the works, activists must begin to develop strategies for confronting such a surveillance state, including possibilities for allying or actively collaborating with nontraditional allies across traditional political lines. At one end of the political spectrum, the movement for transparency and oversight is anchored by liberal civil-liberties stalwarts like the ACLU and the Electronic Frontier Foundation, which recently obtained via FOIA request the list of 50 organizations already legally flying drones. Meanwhile, the topic of domestic drones has recently captured the conservative imagination. In June, when a Twitter user’s misinterpretation of a Fox News story led to a widespread false rumor that the Environmental Protection Agency was using drones to spy on farmers suspected of polluting the water supply, it took only a few days for the story to gain speed, amplified by conservative blogs such as NetRightDaily, then erroneously repeated by Fox News and other outlets; at least four Republican congressmen were demanding answers from the EPA before the story was dispelled. The fact that such a prospect (true or not) provoked such outrage on the right provides a powerful lesson. Working together across political lines, activists could more powerfully assert the demand for privacy and accountability — perhaps even take advantage of the existing lax legislation to create DIY robotics to aid in acts of civil disobedience, reporting or art. While all who are concerned about human rights are surely grateful for activists and reporters focusing in on war crimes by U.S. robots of war abroad, let it not distract us from organizing and strategizing around the less deadly but more insidious specter of the surveillance state at home that, if left unchecked, will soon be set in motion. I don’t think the US Government and White House would like it much, if reversed and other countries targeted “drones” on US soil and at the White House !! Well, it’s interesting. As this story suggests, our society seems to be on the brink of embracing the presence of drones on our own soil, through a series of economic and political justifications — perhaps in some ways much like Pakistan’s government has come to tolerate U.S. drones there. The trouble with militarism is that it can be insidious, and we can get used to it, and feel like we depend on it, before we really have the chance to ask serious questions about it. Imagine if you will that the above scenario applied to “Communist” China. What would the American President and the politicians, the media and the American people have to say? It’s time the Chinese sent over some female gas bag to lecture the USA about human rights. Following the example of Code Pink in deciding what to do to counter any program of the U.S. government is a mistake. That and similar protest groups attracted to theatrical displays of rage seem to be notable mainly for never having significantly influenced public opinion, much less any actual political outcome. Do something pragmatic, such as: Organize a coalition of groups to target a few specific members of Congress in swing districts on the basis of specific votes they have taken on specific obnoxious programs, and defeat one of them. Just one. Then, if you’ve had a good media strategy, you’ll get the attention of the political class, particularly Democrats. Then two years later, defeat five members of Congress. Then you’ll really get the attention of the public, and acquiescence to those programs will start to liquefy. If you’re serious about changing history, you have to go to the people and organize them, and keep doing it — for twenty years. If you’re unwilling to engage in on-the-ground political organizing over the long haul, berating the temporary occupant of the White House or “the war machine”, or dreaming about some sort of revolution which isn’t going to happen, is a waste of time. Angry protesters will not stop drones. Conventional political space still exists in this country. Use it or lose it. While I think you’re very right about the limits of theatrical protest and the need for other forms, we also shouldn’t discount the value of the theatrical — whether it’s Ai Weiwei in China or Reverend Billy in campaigns ranging from Starbucks to MTR mining. We’ve criticized Code Pink’s tactics in these pages before, but it’s true that they’re one of the few groups that are really trying to focus people’s attention on drones and to arouse interest in opposing them. (There are others, such as Nevada Desert Experience.) This is a helpful precursor to the kind of broad-based movement you describe, not an alternative to it. Nor, I think, does the author intimate, as you seem to suggest, that Code Pink’s methods are either effective or sufficient. She simply remarks that they are happening, while so little else is. Governments are becoming the insurgency and are the terrorists. This is a self-defence issue. No idea is without merit. Develop a counter-drone air force which uses Paint-ball ammo. Develop a drone jamming capability – both land and air. Develop missile batteries using model rockets. I think it’s important that all of us who are concerned about the surveillance UAV issue commit to educating ourselves about it. The ACLU’s blog is a great place to garner reliable information. It’s important to separate facts from rumors, of which there are many around this issue (for example, the alarming idea that there will be 30,000 drones in US airspace by 2020, attributed to the FAA & repeated ad infinitum in both left and right hemispheres of the blogosphere — despite FAA disavowal of the number). We can also empower ourselves by joining with the Electronic Frontier Foundation to urge our municipal governments to prevent law enforcement misuse of UAVs, or work to ban them outright. You can find out whether and how your local police agency is using drones, and what to do about it, at eff.org.